Bricket Wood is an 'island community' surrounded by green fields. Development commenced in the 1930's but the origins of the area can be traced to pre-history. We live on a spur jutting out from a glacial drift deposited during the Anglian Ice Age - ca 30,000 years ago. Melt waters swirling around the base gave rise to its name Bruteyght - O.E. Bright Islet. Early man found the terrace along the edge of the spur overlooking the Colne Valley ideal for settlement and there is slight evidence of a Bronze Age site. The sticky, glutinous clay, however, was impossible for early man to till but a good living could be had from the wetlands below and the woods behind. The Romans largely avoided the area but, after a disastrous fire in nearby Veralamium in 160 AD, our erstwhile useless clay proved the nearest source for the replacement of lost ceramic wares and many tile kilns sprang up. A villa and bathhouse were constructed to act as a collection point, together with an enormous warehouse, and a jetty alongside the River Ver as both the Ver and Colne were more navigable then. Next to the Bronze Age settlement, the agrarian Anglo-Saxons established Heanhamstede - the place of the High Heath. According to the Doomsday Book (1088) 165 people lived there but by 1353 it had been abandoned, possibly due to the Black Death (1349). 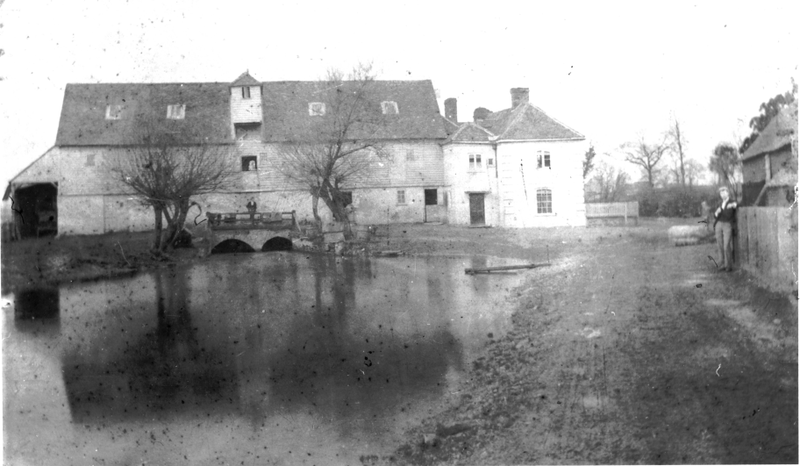 The two mills mentioned, however, Moor Mill and Park Street Mill, were both milling until well into the 20th century. The survivors moved up Drop Lane to Smug Oak Green which stood at the edge of the Common (known as the Great Waste). In the 1560's, present day 'The Hansteads' and 'Green Man Cottage' re-occupied the eastern half of the settlement. From Saxon times Bricket Wood lay within the Manor of Park whose Lord was the all powerful Abbot of St Albans. After the Dissolution (1538) and through marriage, Park passed in 1661 to the Earls of Essex who held it until the beginning of the 20th century. In 1935 the Rights to the Common were purchased by the Hon. Elsie Faulconer, a daughter of the 3rd Viscount Knutsford of Munden, and the family have held them ever since. For centuries the way of life was Anglo-Saxon, with farmers and labourers living alongside each other in hamlets: Oakhurst - now Netherwyld Farm, Waterdell - now under the M1 bridge and Cold Harbour - later known as Bricket and then Old Bricket after the railway opened in 1858. In the 19th century straw plaiting for the hat trade in Luton augmented agricultural workers' incomes. There was a little brick making and employment from wood cutting. Hanstead House (now part of the HSBC Group Management Training College), built in the 1860's, was the home of the famously rich Yule family for more than the first half of the 20th Century. The railway cut through the Common dissecting Smug Oak Green into present day Smug Oak Green and Pound Green, so that Smug Oak Farm is now in Pound Green! The farmhouse is the Queen Elizabeth the Queen Mother Centre, the farm buildings belong to the Parish Council, and the old dairy is the St Stephen Parish Centre. In 1889 Henry and William Frederick Gray set up Woodside Retreat Fairground and the station was modified and the platform extended to accommodate the hoards of visitors. In 1923 R. B. Christmas set up Joyland in competition on a site opposite on Smug Oak Green. Both enterprises were closed in 1929. Mr. Christmas went on to build bungalows with their own water supply and sewerage on part of his estate: South Riding, North Riding, Oak Avenue and The Crescent. He gave the land and built St Luke's Church (to the architect's design). In the 1950's Handley Page moved their workers from Cricklewood to Colney Street and houses were built for them on the remainder of the Christmas land. In the 1930's Blackboy Wood, which stretched from Old Watford Road to Station Road, was sold. Locals from Watford and St. Albans bought five acre plots with no sanitation or lighting and erected holiday chalets. Water came from wells. It was the era of the Sun Cult and at least five plots were purchased for naturism but only two remain, Five Acres Country Club and Spielplatz. 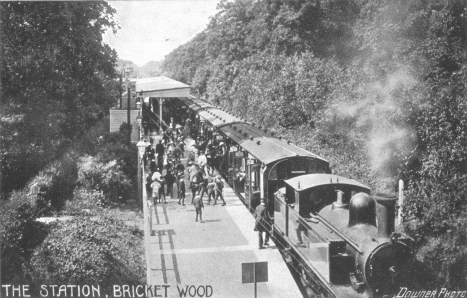 In the past fifty years the pressure for housing and the increased accessibility of the area, due to the building of the M1 and M25, have metamorphised Bricket Wood from a scattered rural community into a large, compact village. See also Development of Bricket Wood and Historical Map with Archaeological Additions.